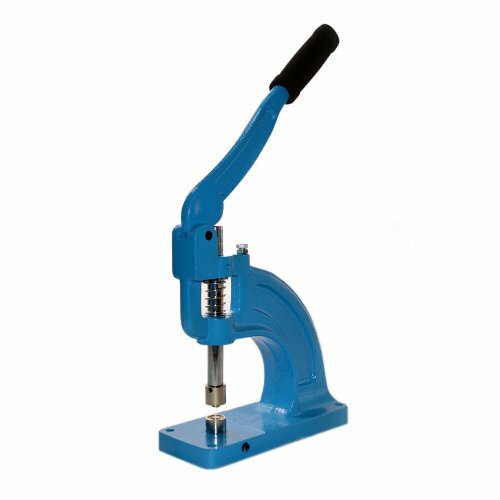 ALEKO® SGM01 Grommet Machine is a perfect hand press grommet machine for semi-professional and home. It can make a various sizes of grommets by changing the different die quickly. Its large throat distance enabling the different grommets’ required. The soft rubber grip on the handle provides more comfort when operating, special design, hand force greatly reduced. Aleko SGM01 is very essential equipment for Dress Makers, Arts & Crafts, Sign Shops, and Manufacturers. Applicable for Banners, Signs, Awnings, Posters, Curtains, Digital Printing, Scrapbooking, Corsets, Belts, Bags, Shoes, etc. 2 die sets are included #1 and #2, and comes with 1000 self-piercing grommets and washers, size #1 (5/16) and #2 (3/8) 500 each. Terrific value and fast shipping! Replacement warranty 1 year.